This posting continues with the developments in QA: What is Bio-Quantum Logic Convergence 1&2, plus QA: What is the Formula for Being-Matter Interactions, and in QA: What is the Formula for Information. Let us add Stem—Branch—Five Element Door to the Diagram on Eight Arrays / Five Elements-Hidden Entrance to the Vacuum developed in QA: What is Bio-Quantum Logic Convergence 1 & 2. This superposition is shown below. 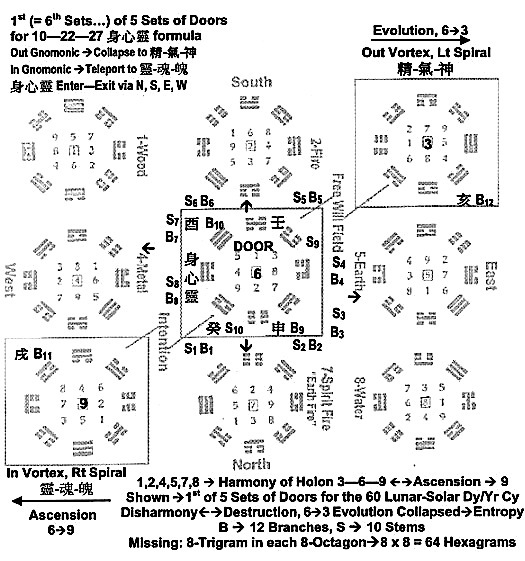 Notice, there are Eight Doors; namely Six Doors in Five-Element i.e., Fire, Spirit/Earth Fire, Earth, Metal, Water, Wood, plus two Doors open to In-Vortex, and Out-Vortex with the 甲戌–乙亥 (S1-B11, S2-B12) pair. The other four pairs are: 丙戌–丁亥 (S3—B11, S4—B12), 戊戌–己亥 (S5-B11, S6-B12), 庚戌–辛亥 (S6-B11, S7-B12), 壬戌–癸亥 (S9-B11, S10-B12). Again, we have another set of five-phase transition elements. Thus, these Two Doors govern the Universe’s Logic Holon of Involution—Evolution—Entropy/Entanglement. In addition, the positive and negative Holon interactions of Stems—Branches—Five Elements that generated the Free-Will (Entropy) Field are derived in the posting, QA: What is Quantum-Metaphysics (Soul-Personality of Numbers). In short, the importance of Diagram 1 is: It is the right-brain ancient scientific formula (re-formulated with the author’s left-brain), which is equivalent to today’s left-brain Quantum-Relativistic Formula in physics. These two diagrams contain the details of the Human side of the entire Matter-Being interacting 身心靈 formula 10—22—27 that expose the secrets of the I-Ching integrated with the Tree of Life. In short, Diagrams 1 & 2 exposed (in the author’s left-brain, with the help of right-brain) the ancient’s right-brain matured formulations of the vacuum via their “psychic” Brain-Visions and / or Brain-Knowingness. Next, the connectinn to the matter side of these vacuum interactions is shown below, again taken from QA: What is Bio-Quantum Logic Convergence 1 & 2. 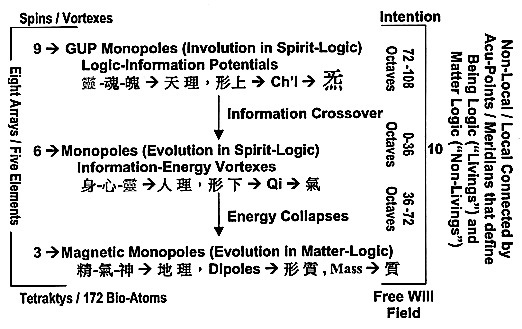 For explanations of these Monopole mappings, see The Matter-Being Project: Putting Mind-Soul-Spirit into Physics-Chemistry-Genetics-Technology, Chapter Two, Part I – Completing the Incompeteness of Relativity, Electricity, and Magnetism. I just wanted to state here briefly the connections between the soul-spirit aspect of monopoles, atoms, and Acu-Points. … there is the following Holon formation Monopole-H(172)—isotope—Atomic Formation. That is, the bio-atom H(172) [mapped onto the Acu-Point Networks] can be viewed as a huge Neutron Object (namely 171 neutrons and 1 proton) that contains the information-energy of the entire set of atoms and their arranged [collapsed] configuration in the Periodic Table. 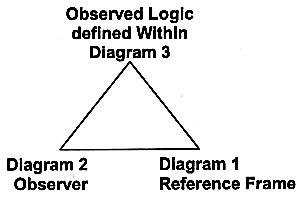 As shown in the posting QA: What is Quantum—Metaphysics (Soul-Personality of Numbers), the Stems, Branches, plus five-element are connected in the binary logic of Yin-Yang. Notice, the formulations embedded in all the above are Holons with their interactions. Thus, as derived in this Matter-Being Bio-Quantum Formula, the Holon Theory of Everything is embedded within the Matter-Being Paradigm. This term “Everything” addresses not only all forces in Modern Physics, but also a term that includes every subjects of human knowledge as the author attempts to indicate in this Website. It is these Local—Non-Local vacuum connections that created entanglements in the Logic Vacuum crossover into the Information Vacuum. It is also these Local—Non-local connections that formed the free will perturbation field (or the entropy) within the universe’s vacuum states, as indicated in Diagram 1. 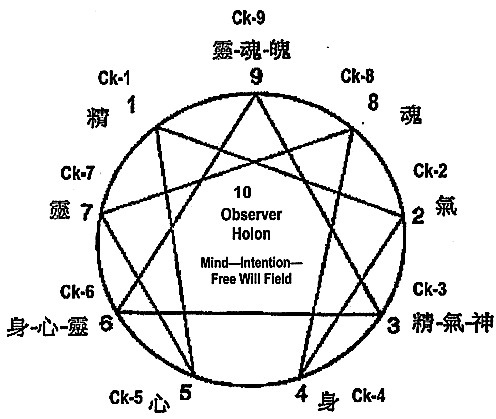 This field can be computed, or identified in principle, using the interactions indicated by the Door within both the observer-observed Stem—Branch—Five Element Holons via the Observer’s Brain-Soul visions and/or Brain-Spirit knowingness. Using the information–disinformation, a Faraday Cage for shielding the free will field is necessary. Some of these repeatability issues have been clarified and discussed within this Website and in Wing Pon’s writings as summarized in posting, Wing Pon’s Writings and Videos. CONNECTIONS TO DIAGRAM 3 through Electron Tunneling (or Quantum Well): The key is to connect atoms with the monopoles, which are separated by space between the electrons and the nuclei. Remember, Reality is an Observer—Observed—Reference Frame created, where even the Observer does not know what is his, hers, or its reference frame. As long this reality is self-consistent inside the observer-observed box and has no conflict with the boundary of its reference frame, this reality can be use to “co-create”. The key is there is “no conflict with its reference frame boundary”. Unintentional reality is newly created reality not yet learned by Nature. In this latter case, unintentional implies that other by-stander observers do not believe this newly co-created reality. These unintentional observations are part of the free will field. CONNECTED TO DIAGRAM 2 through Brain-Soul Visions and Brain-Spirit Knowingness. The key here is to familiarize yourself with (or better yet, become experts) in converting learned knowledge from books and experiences into a state of knowingness.